It's hard not to think of side ponytails and legwarmers when looking at the Botkier Chrystie bag. This designer hobo has a definite 1980s air about it, but thankfully the result is more of a loose translation of that particular fashion period than a literal one. Legwarmers might come to mind, but they seem to be making a comeback of their own anyway. The most prominent detail on the Chrystie is the distinct shape of the hobo. In reality, this clever Botkier bag is actually like two in one. It's as if the designer took two triangular bags and molded them together to create this unique silhouette. The result is a funky, rocker-esque purse that is surprisingly slim but with an ideal amount of storage. Each side of the Chrystie has a zipper that runs diagonally down the bag. I love the slight edge added with the tassel details. It gives it a little punch of personality without looking like it's trying too hard. The majority of the bag is smooth leather, but Botkier added some variety by including panels of snake-embossed leather on the front and back of the handbag. The black version is basic, but the simple color palette allows the shape of the bag to shine. If you really want to stand out, though, the Chrystie comes in a bright metallic bronze color that will definitely catch the eye. 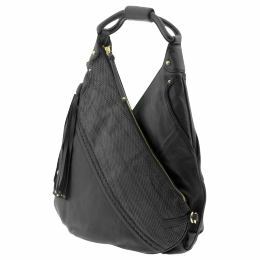 Look for similar snake-embossed panels and v-shape on the hobo's sister bag, the Chrystie Satchel, that is equally chic but a bit more grown-up.